Old Country Store and Emporium, West Mansfield Village, Mass. Old County Store and Emporium, West Mansfield, Massachusetts. by Eric J. Hurwitz. Article updated on Dec. 31, 2016. 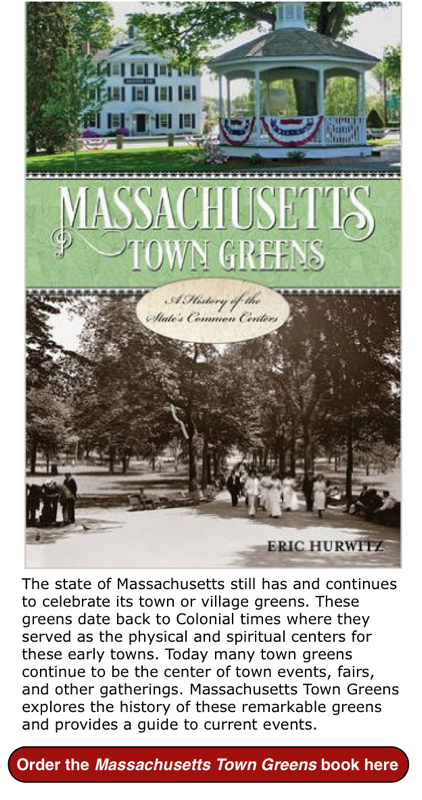 When thinking of old New England country stores, Vermont first comes to mind -- not the southwest suburban Boston town of Mansfield, Mass. Away from all the high tech companies on Forbes Blvd., the modern Mansfield Crossing (L.L. Bean, Kohl's, Best Buy, etc.) shopping complex and the seemingly endless Mansfield suburban neighborhoods resides the Old Country Store and Emporium, tucked away in the more tranquil neighborhood of West Mansfield Village. Surrounded by Colonial and Victorian homes, the Old Country Store, at first glance, looks like a modest-sized country store that might sell a few souvenirs and candles. On the contrary, the Old Country Store is one of the largest country stores we've been to in New England, comprising 12 rooms totaling 17,000 square ft. Items for sale include home goods and furnishings, food (including sweets and freshly ground coffee, maples products, Vermont Common Crackers and a peanut butter machine), toys, player pianos, bird feeders, books, crafts, hardware, antiques and memorabilia, an amazing collection of grandfather clocks, cosmetics, and locally made furniture. 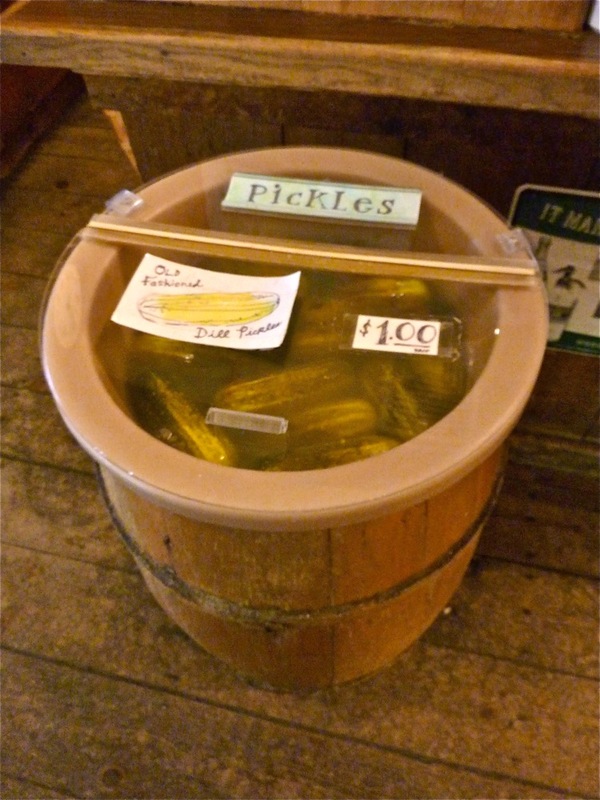 They even have the old-fashioned pickle barrels -- the ultimate proof that this is a real country store. Pickle Barrel at Old Country Store and Emporium in Mansfield. Some name brands include Hubbardston Forge, Nichols & Stone, Moosehead, Acorn, Howard Miller, Baldwin & Yankee Candle -- but you'll also find some great locally-produced merchandise, too. Yes, they do have candles and souvenirs, also, but never dominates the innate country store feel. 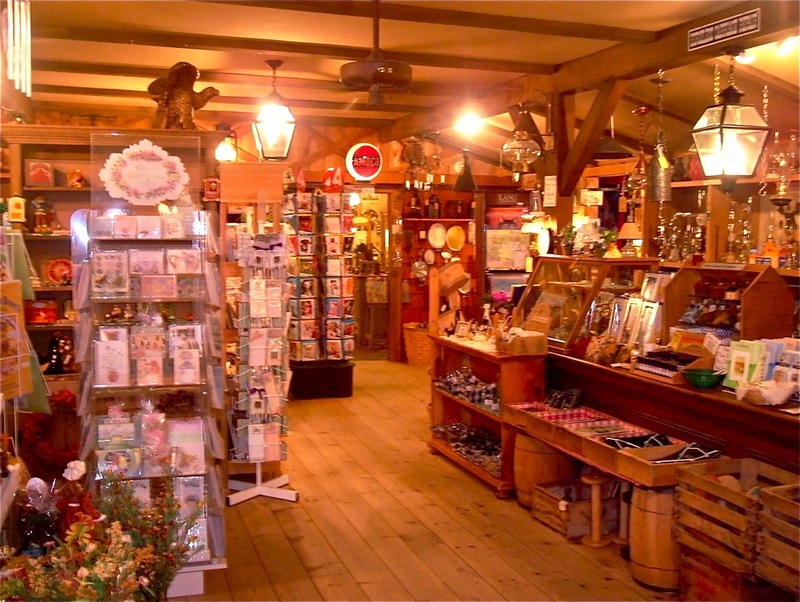 In continuous operation for more than 175 years, the Old Country Store is as authentic as they come in the genre of charming New England country stores. Classic country store scene at the Old Country Store and Emporium. It's easy to get turned around, as the architectural nooks and crannies go in every direction. There's even an upstairs "attic" that looks like a cozy bedroom -- and sells, surprise, beds, dressers and rocking chairs. The Old Country Store also features a lamplighter section, where customers can bring in their old lamps and have them repaired and/or restored. The most surprising element here is the great variety of furniture with square footage larger than some furniture stores. The most heartwarming section: the post and beam entrance with its long cashier's counter, creaky wooden floors, an antique candy counter, homemade fudge section and fine teas and jams. You'd swear you were in Vermont! 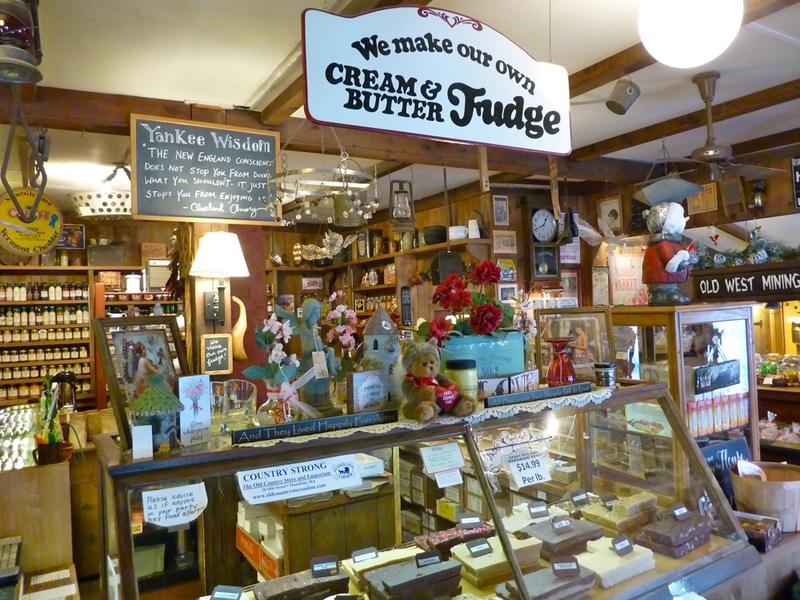 Fudge section at the Old Country Store and Emporium. 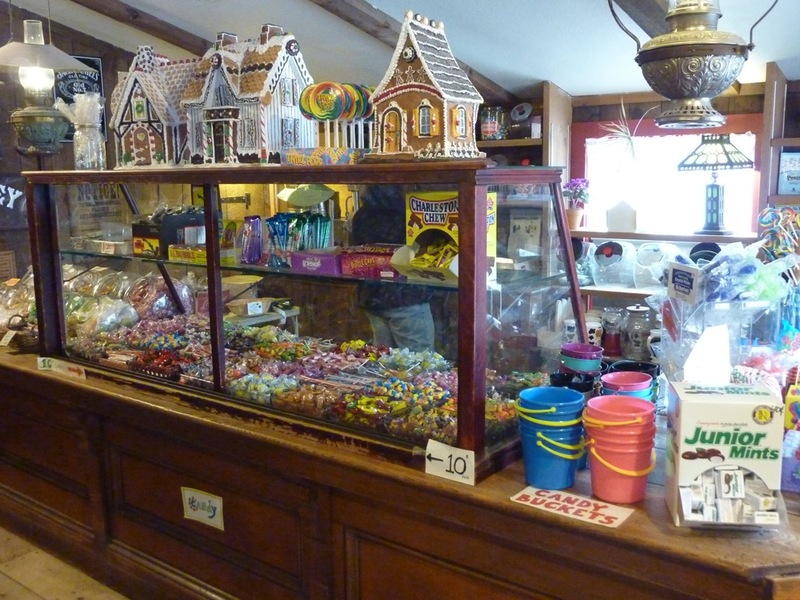 Old fashioned candy counter at Old Country Store and Emporium. The Old Country Store and Emporium is about as good as it gets in regards to country stores in New England, and it's not even remotely located in a place you would ever expect one. 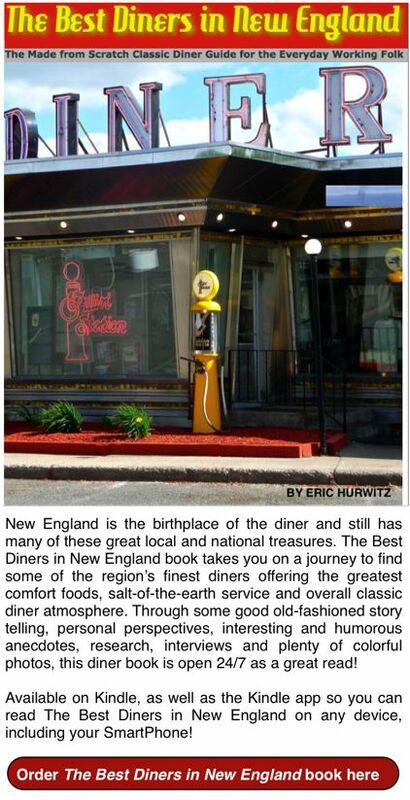 The sights, sounds and delicious aromas will thrill you, en route to a return to yesteryear. The Old Country Store and Emporium is located at 26 Otis St. in West Mansfield Village, Massachusetts. Tel. (508) 339-8128.